I’m sad. Not just sad, but super sad. Here at Foodamentals, we pride ourselves on staying on top of the newest and trendiest food news around the world/internet. However, this one may have slipped through the cracks and for that, we are butting our heads against the wall. On the flipside, the site wasn’t even around when this promotion first set sail back in 2013. 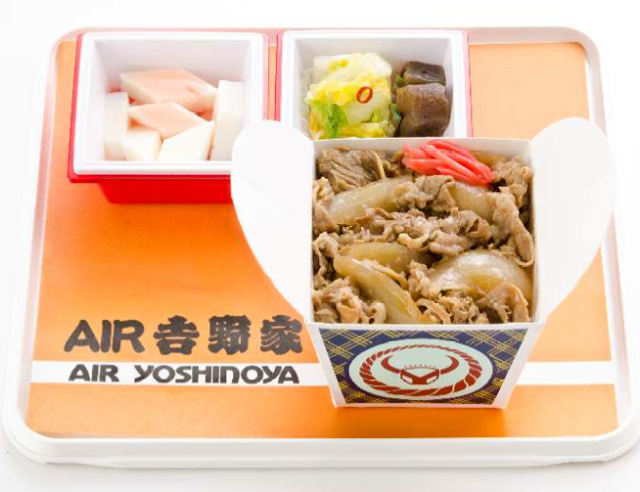 What will now be affectionally known as the golden age of aeronautics, JAL airlines had apparently commissioned Yoshinoya to serve their famous beef bowl meals onboard their aircrafts… for the 5th TIME. Passengers on flights from San Francisco, Los Angeles and San Diego were able to get access to the meals, whereas people from other parts of the country, totally, missed, out. Not sure how they are pulling this off, since typically food gets completely distorted when it gets run through the inflight reheating process. But, at the end of the day, it shouldn’t really matter as long as you enjoy your teriyaki chicken and rice. At least, thats how we think of it. No word yet on whether JAL is planning to bring this back for the 6th time. But, this writer will be eagerly awaiting its arrival here stateside.